Medical adhesives for medical application. Optical adhesives for bonding and protective coatings in various fiber optic applications. Electrically and thermally conductive adhesives for the semiconductor, optoelectronic, automotive, aerospace and electronic assembly industries. 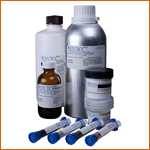 Thermally conductive line of epoxies are used for high-tech electronic applications. Complete line of high performance Ultraviolet (UV) cure adhesives ranging in viscosity, flexibility, refractive index and light transmission.